Do you work for Eclipse? Learning about Eclipse? We can help. "Ideal IDE for code development"
"Perfect IDE for project development"
Application development with this IDE is very easy. Integration with different tools is so smooth and this has different plugins so we are abke to use these as per the need. We are easily able to use required themes in our project on the requirements basis to add the enrich look and feel in application. Its Intellisense functionality is much helpful during programming. This tool is pretty much secure, powerful and reliable. Its a cross platform comaptible. In this tool build, debugging process are so simple. Entey level developer need to put more efforts - how to use and configure advanced features of this tool except that so far we did not experience any issue with this. Yes, go for this IDE its a perfect tool for project development. Reduced time on project development efforts as this task became easy with this tool. Improved project delivery and increased productvity. Build process is easy and quick. "Eclipse. El IDE top mundial." Lo que más me gusta de Eclipse es que es gratuito y no supone una inversión económica para mi empresa, y en cambio, nos da un servicio muy útil, pues nos ofrece un entorno integrado de desarrollo para programar en lenguajes como Java. Es multi plataforma, pudiendo ser usado en ordenadores con sistemas operativos linux, mac o windows. Ofrece coloreado de la sintaxis en función del lenguaje de desarrollo. Posibilidad de integrar pluggins para ampliar funciones. Posibilidad de compilación en tiempo real. Múltiples pestañas para editar varios archivos al mismo tiempo. Posibilidad de utilizar con lenguajes de programación estructurados y orientados a objetos, incluso para lenguajes de marca también es válido. Voy a mencionar algunos aspectos que no me gustan, pero que no desmerecen poner nuestra confianza en este IDE tan popular. Consume gran cantidad de recursos de nuestra máquina, principalmente RAM. Hay errores a la hora de integrarse con algunos pluggins específicos. La interfaz transmite poca confianza, pues es de aspecto antiguo y obsoleto. Hay que mejorar urgentemente en este sentido. Las actualizaciones podrían ser más periódicas. Se echan en falta mejores traducciones de las funciones en la aplicación. No trae de serie un controlador de versiones, para facilitar el trabajo colaborativo en equipo. Yo recomendaría utilizar Eclipse como IDE para novatos que se inician en el aprendizaje de la programación tanto como para expertos que dedican su profesión a la programación, independientemente del lenguaje, pues Eclipse no es para nada específico para un único lenguaje. Existen diferentes IDE para multitud de lenguajes de desarrollo, y con Eclipse conseguimos reunir todo lo que necesitamos en un único entorno en lugar de tener varios específicos para cada lenguaje. Lo utilizamos para nuestros cursos de programación orientada a objetos con java, y también para programación estructura en C.
Eclipse is an IDE that supports many programming languages so, unlike other similar applications, it does not need external plugins to be compatible with programming languages. One of the best things we can do with Eclipse IDE is to manage the database remotely through the MySQL interface that exists in the eclipse Marketplace. I also liked that with Eclipse IDE it is possible to use different java compiler versions, that provided by Oracle (Oracle JDK) and open source (OpenJDK), both are 100% compatible without any type of program or error. The Eclipse interface can also be modified since it gives us 3 options, the classic, default and the current one that incorporates the most innovative improvements. The application consumes a considerable amount of RAM and this is due in large part to the use of the virtual java machine. The high consumption of RAM limits a bit when using Eclipse IDE on certain old computers or laptop with a small amount of RAM. Eclipse is one of the best IDE to program in Java, Php or C ++ since it was one of the first applications of this type that was created and therefore is the leader in this aspect the other IDEs usually copy what implements Eclipse first. Also Eclipse is an application free of charge since the project is maintained thanks to donations. With Eclipse I can program much faster because the program automates most of the process thanks to its auto completion, templates for files and shortcut to perform the actions much faster than looking for them with the mouse. The debugger that provides the IDE for java and C ++ provides very good information about compilation errors so it is very useful to solve bugs. "Easy source code review without leaving your Eclipse perspective! Join the thousands of developers ." 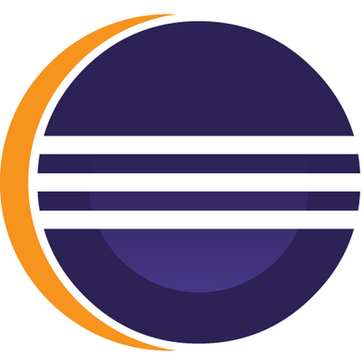 I have been using eclipse for many years, long ago eclipse was the only java IDE that existed and was widely used and known all over eclipse is famous for our Java Integrated Development Environment (IDE), but our C/C++ IDE and PHP IDE are pretty cool too. You can easily combine language support and other features into any of our default packages, and the Eclipse Marketplace allows for virtually unlimited customization and extension. Eclipse is a memory eater.It’s never satisfied with it’s heap size.It slowed down a fairly great Dell latitude with intel i7 and 8gb RAM. It’s routine to kill the eclipse process every now and then. Please Solving Eclipse is a memory eater.It’s never satisfied with it’s heap size.It slowed down a fairly great Dell latitude with intel i7 and 8gb RAM. It’s routine to kill the eclipse process every now and then. "Good IDE written in java"
The best thing about Eclipse is the customization capacity offered by the application to organize your work area and be able to use it in a more comfortable and efficient way. There are also a large number of plugins available for eclipse that are created by the community and then placed on the Eclipse Marketplace. Especially the Git plugin seemed very useful to link my local repository with the remote repository hosted in the repository of GitHub repositories, it is also possible to store the password to avoid having to enter constantly. And finally another feature that surprised me in eclipse is the integration and ability to use Gradle a library that allows you to manage your projects much more effectively and manages and downloads libraries remotely. - The worst of Eclipse is undoubtedly its outdated interface, unfortunately this IDE is very complete and powerful but visually it is very ugly, especially in its version of linux. - The rendering and antialiasing of the sources is horrible in the linux version, for example the font consoles in windows works perfectly but in linux it looks pixelated. I recommend Eclipse as an IDE to program especially in Java because it is a strong point and also its debugger is the best I've seen so far in any IDE. To program in PHP I recommend you look for another application, I personally do not convince me. The biggest benefit that I have found when using Eclipse has been in the organization of my projects since now I can find everything faster, I have also gained in efficiency and speed when programming thanks to the default templates for the creation of classes. But where else highlights eclipse in my opinion is in the plugins section, without the community and its contributions this IDE I think it would have died a while ago, I personally use the plugins of Gradle, Java Build Designer and Color Themes. - I use a plugin for the design of UI in java and it has many glitches graphics and even crash sometimes, I'm talking about the Linux version. - The interface is very old, even changing between different options available are all very similar, in this aspect eclipse remains behind its competitors. I would recommend Eclipse IDE only if you are going to program in Java, you should keep in mind that for Php, python etc ... there are much more developed options that give better support to the language. Regarding java, I recommend you eclipse by your UI designer and Java debugger. Also in Eclipse you do not have to buy licenses to use it. 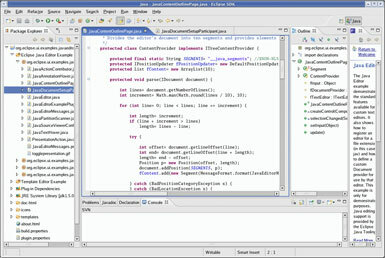 The use that I give Eclipse IDE mainly is programming in Java because even with all its problems eclipse is one of the best IDE to create applications in Java, its debugger is the best thing that I have tried in an IDE until now and you can also create interfaces in a graphic way what makes everything much simpler and faster. It has a large community, the graphic interface can be modified to your liking. Highlight the code so that it can be understandable, it is light, pleasant at first sight. I can work with java quietly using this IDE. Being a general IDE, which can be deployed many programming languages, it costs to be submerged within some specific, is not focused for mobile development and this is highlighted as a negative point. The great community that exists for this IDE makes the use very simple, for the basic development is very good, I recommend it for all those who are just immersed in the world of programming, it will be very useful, they will understand it quite fast and can develop and implement different types of languages with this IDE. E deployed small applications without any kind of problem, zero bugs and the operation is quite fluid, I currently perform in the development of algorithms with the Java programming language. I also used it at the time to develop C / C ++ and a bit of PHP. "Best general IDE out there. Plenty of customizations and a rich feature set." Ease of use, good UI, plenty of customizations and a large community. Plenty of plugins for every feature (Git, Maven, Ant, etc). I also find this to be the best IDE UI in terms of ease of use, color scheming, efficiency, etc. Not the best for Android/iOS development (purpose-built products exist for these), but that is to be expected since this is a generic IDE aimed to fill many use cases, vs a deep dive into a few. Also, this may suffer in terms of frequency of product updates, since this is a community-built IDE, but this isn't a big pain point for me. Best IDE for general programming purposes. If you develop within a framework (Android, iOS), there may be better purpose-built IDEs out there. Great basic IDE for any language you choose. Easy to set up, and installation is portable to different computers. I'm using this for PHP webapp development, a Java headless Unix servlet, code deployment to AWS via external scripts, and as a Wordpress configuration editor. "Awesome freeware! Good for small and medium size projects"
Its fast and provides extensive 2nd and 3rd level context menu shortcuts. Awesome plugin support and active community help. For huge projects it is really very slow and builds don't go through. They are hung in the middle and requires several restarts and skipping modules which are not a necessity. Its a very easy and awesome tool to use if you are dealing with around 1000 -2000 files and handful of modules (may be 10 - 20). For other multi module large enterprise projects please evaluate according to your requirements. Mostly it goes well and I seriously recommend this. Out of my 11 years of development, I have used Netbeans(1 year), IntelliJ(2 years) and Eclipse(11 years). Most of the time I didn't need any tool other than Eclipse. This is because of its support for multiple plugins and ease of use. I am a Java developer for 11 years and I have been developing web applications, desktop applications and many more stuffs. Easy to learn and be productive is the biggest benefit. It doesn't eat up memory due to indexing and gives a quick startup. Eclipse is the best IDE which is freeware and support multiple languages. Eclipse is very fast and giver code support which is the best part. we can directly use libraries by just importing it. The best part of eclipse is that it support multiple language and has a large set of libraries which makes our work easier. Now a days Installation take so much time and it require so much dependent software. In older eclipse version it was not taking this much time in installation. Eclipse website confuse user, which version or which module of eclipse they should use. I would like to recommend eclipse to my colleges as it is very easy to use, support multiple language and have lot of supportive libraries which makes programming easy.there are lot of sources available for support. We can use eclipse for software development using java,python. Also we can use eclipse for data analytics and for software testing. Cost was the major problem due to other software like HP QTP. but eclipse solve this problem. I wanted to automate my VOIP application and network connectivity using python. For this is search lot of software and found pydev in eclipse is very easy to use. "very useful but outdated now"
It is opensource. Eclipse is widely used have many plugin and a huge community that can help everyone. You can push your project between clients and work together. The updates and latest build releases come out quickly to fix bugs and ensure compatibility with each Java version update. The updates and latest build releases come out quickly to fix bugs and ensure compatibility with each Java version update.it was help full if it has a explained documentation.Have to remember the short cuts. Every java learner and java user should try Eclipse at least once. you can use this for teaching purpose or learning or implementing purpose or company purpose.Coder and Debugger should try it .it is very fast to use so go for it . I have used eclipse to develop commercial software on embedded micros and also for PC desktop applications.Has a lot of manuals and documentations to do everything better. "Very easy to use and great for learners"
I found it very simple to start new projects and functions. It has an option for new main functions, saving the time and limiting errors. There are also many additional functions for editing in Eclipse, however these might not be obvious right away. It is not very good for languages other than Java. It has a very cluttered feel to it as well. There are many features that Eclipse has, but people are not aware of them because Eclipse doesn'y do that well of a job at showing them off. Use many tutorials when first starting as learning all the features offered are not clear once you first begin. It can be very confusing to use if you did it from scratch. I use it for basic program development. It has many features to make it easier to start new projects and files. I found it beneficial for editing as it is quick to catch syntax errors and helps to make the code look more organized. It also has organizational benefits, making it easier to organize files and projects and quickly find what you are looking for. I am using that for python development in my work location. Earlier I am using this launcher for Java development also. So I am with this IDE so long time. And in every new update and new launch it is providing far better solutions and graphical interface. Along with this it has it's own marketplace where you can download different tools which enhance your user experience. Apart from tools in its market place you can download themes for your IDE too. The main thing I dislike is its loading time. It takes too much time to load. Event in updated version takes much time in starting up as well as it consume lots of memory. From this IDE I am just this way dis satisfy. Apart from that one more point is some how it is complicated. Also some time it looks like IDE is clumsy if your screen resolution is lower than you felt this point and you started discussion. I am developing different solutions and apps using this IDE. Even i like to use this app's market place too. In my company we are developing code here and functionality provided by them of debugging and developing is amazing. Also from the same IDE I am using different libraries which helps to improve coding. Along with this there are shortcut keys are which are too useful for speedup coding. "Nice, adequate and strong Java IDE (most importantly free)"
Eclipse has right from the beginning has strong support for Android developers which is a plus if there is requirement to deal both with enterprise java apps and Android apps. It has adequate support for other JVM languages like groovy, scala and such (along with nice support for python lovers). STS flavor of Eclipse is really good for Spring based Java projects. Pretty decent debugging options. As its a package and not really an installed software, there is really a good chance that the development system has multiple eclipse launchers with multiple different configuration. A single installer with single version would be nice. Also, updates very frequently lead to corruption of current installation by giving strange pop-up windows with no so helpful error messages. Also, some plugins downloaded from Eclipse market place really do not do what is being advertised and possibly should be verified by Eclipse in terms of their stability. No in-built way to create really good class diagrams. Smart suggestions (AI based!) could be a really neat features especially when Java versions are rolled out withing quite short release cycle which could really help cope up with the newer and major features like functional programming, modular programming and such. As Eclipse is free and have been in market since very long, most of the developers are familiar with its features which serves a common dialogue between colleage's. In this sense, knowledge and familiarity with Eclipse really does help with peers. "Excellent IDE to createweb application projects and develop at a higher level"
It has an great autocompiler and provides a lot of help with all its libraries and modules. Easy integration with GIT. Plugin support is excellent in eclipse. it also supports various servers. There are random crashes while using at high level.It is very heavy.It is pretty hard to install in a MacOS. Eclipse is so far the best IDE we have used for developing web applications and writing automation scripts. ]it has huge community forums to help with your problems. It is compatible with many other languages, but it works the best with Java, therefore if you are planning to use Java as your primary language, do try out Eclipse.Also, it is available for free, First try trail version. It does have some setbacks, like it slows at times and needs to be restarted, but it has really made the development process easier in our organization. "Best IDE for Java Developer"
Eclipse is easy to use for Java applications.eclipse is open source. You can also install different Themes to change the look and feel of the eclipse. it has a nice elegant UI. Dark theme and default theme. dark theme is the best. Eclipse has got nice Predefined functions like getters and setters. I like fonts colors and style. It takes a lot of time in starting the workspace. It is quite a bit heavy on your memory and CPU when performing large enterprise project execution that time slow work this is the main problem of this IDE. It is a good IDE and easy to use. who is the Java developer or programmer this ide is the best ide for developing purpose. It is great for open source Java development IDE. I have experience using it to create a Java Web Application and Desktop Application. "Best open source IDE for Java development"
It is best suited for development of any kind of Java application whether it can be desktop application or J2EE. It is very easy to use. It also supports other languages too. It has different plugins supported which helps the developer in developing its application faster. It provides support for android development. But it is not that much effective as Android Studio specifically for the development of the android application. There are few occasional bugs too. Apart from this, it is best suited open source free IDE for development of Java application. Best suited for developing Java application. If you want to new to Java language or even experienced Java developer then this is the best open source IDE available till now. And it is very easy to use too. I have used it mainly for developing Java web applications. Apart from that, earlier I used to use this IDE for Android development too. It has very good plugins which had helped me in developing better applications. Eclipse es un excelente software open source y gratuito. Ha sido creado para facilitarnos la vida en nuestras labores de programación ofreciendo un entorno de desarrollo integrado (IDE) funcional con Java Development Tollkit y su compilador ECJ. Entre las ventajas que ofrece, tenemos que colorea determinadas palabras según la sintaxis del lenguaje de programción en cuestión, permite realizar pruebas con JUnit, hay un controlador de versiones para que no se pisen unas con otras que se gestiona con sencillez, posibilidad de conectar con base de datos (hibernate), etc. Además hay multitud plugins que se pueden descargar e instalar de forma adicional elaborados por los usuarios de la comunidad gracias a que es software libre y código abierto. Entre lo peor, se puede mencionar la nefasta gestión de la utilización de los recursos principales del ordenador como el uso de la CPU o la memoria principal del sistema donde se esta utilizando Eclipse. Es uno de los IDEs más completos y utilizados por las empresas de desarrollo software basado en Java, así que se recomienda totalmente su uso, a pesar de la mala gestión de RAM y CPU que realiza. Pero es gratis y está en constante actualización gracias a la cantidad de usuarios que trabajan en ello al ser sofware de código abierto. Se utiliza en nuestro cxentro de enseñanza y formación informática en las materias de programación como entorno de desarrollo integrado sobre el cuál los alumnos pueden implementar sus programas de forma rápida, sencilla e intuitiva. Además no requiere de pagos de licencia, con lo cual se puede decir que esta funcionando muy bien. Eclipse is first friend for any programming developers. It is best at what it meant to be delivered. Eclipse IDE, Oxygen and Neo are the latest and recent versions which got released and it suffices all the needs for the developers of all stages like beginners to intermediate and to experts. There is nothing to dislike when it comes to Eclipse. As it always before the developers in updating it's version and provide what we want. Eclipse is the starting point for any developer and mainly Java related programmers. Also with the latest version of Oxygen and Neo it has many plugins which solves most of the developing issues like auto syntax auto test conditions and compiling suggestions. And the style auto populations for the front end developers also is way to go use software. Though it is not directly solving business problems, it helps the developers to deliver what business is looking for from Eclipse. "Is a great developement enviroment "
It allows continuous integration and allows integration with multiple technologies. It is an IDE that allows you to develop applications with a multitude of programming languages. The most appropriate is Java, and that is what I use for my application. You can download different plugins from Eclipse Market that help substantially improve the program. The eclipse supports different servers to start the application, you do not have the obligation to use only one. There is a long list of servers to choose from. It also allows the tests with JUnit and Mockito, which are my favorites and I love it. It is a program that occupies a lot of space on the hard drive and weighs a lot. If your project has many files it takes a long time to load. When you start the application the server takes a long time to boot if your project weighs a lot and often stops working. You have to keep in mind that many cleans of the server must be done and be very patient. Debug mode does not work fine when the project is great. Ultimately, I think that Eclipse is better for small and medium applications. If you need to make a robust and continuous integration application that supports different languages, servers and a large support community, this is your program. It's free and at least worth the try. I use this program in my company to develop a program for a very important client. It is a based program that uses java language as the main language but also has Spring, Angular and Bootstrap technologies. It is an ideal ide for this type of applications and very fast. "Buena aplicación para mis primeros pasos en Java"
- Gratuito y de código abierto con bastantes actualizaciones. - Instalación sencilla y posibilidad de instalar gran cantidad de plugins según las necesidades que tengamos. - Disponible para muchos sistemas operativos windows, Mac o linux. - Muy util a la hora de trabajar es el coloreado del código ya que ayudan a identificar las palabras reservadas a java. - Muchas opciones de configuración desde el formateo de código, como escribir comentarios, etc. En función del sistema operativo en el que se instala, pueden surgir más o menos complicaciones. Hecho de menos el idioma español en la plataforma, que ayudaría a poder sacar más rendimiento a todas las características que posee. Se agradecería soporte en castellano tanto en tutoriales como en ayudas internas. Me ayudó a realizar mis primeros proyectos en java y a detectar los errores tanto de en la estructura del código como en la compilación de los proyectos. "Eclipse always scores a 10"
"Eclipse provides multiple platform environment"
Eclipse is open source, it is very easy to find solutions when you have problems with the software. It has a wide variety of add-ons and integrates the Version System we use for version control of Java code. The software is also updated often, and errors are fixed relatively quickly. The implementation in Eclipse could be a major challenge when it comes to copying and saving resources in the directory to ensure that the web server interacts with the problem. You also need to manually clean directories, rebuild and re-deploy when using a virtual machine for some reason. There are many IDEs for several development languages, Eclipse provides the foundation as one of the most versatile platforms available. Since in many ways, Eclipse is open source, there is a plug-in available for any form of development. Try it, because a general IDE is better than several specific development environments. The main problem that Eclipse is giving me help is in software development. It is mainly used to develop Java code. It's better than developing code in a simple text editor and compiling it elsewhere. In addition, I have discovered how to finish a large number of both business and open source projects completed quickly. "Opensource IDE to develop any app"
It comes with a lot of pluggins and additonal modules to complement. You can change the design of the IDE to youe liking and even the appearance to a darker one. It allows you to debug and test your code without adding anything to Eclipse. Just put the dependencies of your testing to the pom. Debugging does not require anything is included with eclipse. Eclipse comes with validations that are super useful to correct little mistakes. It's very fast to run the server and we usuarlly debug a lot with Eclipse. It's the main feature that we use to find bugs in our app. All the languages it supports and all the pluggins that there are to complement the ide. It's opensource and it's free. Sometimes Eclipse does not respond if your application is too big. If it has a lot of files to validate eclipse can not validate all at once and crashes. It consumes a lot of system resources. I do not like that the software is always changing and every now and then is another Eclipse. You have to download it and install your aplication again. The importing functionality is not user friendly because sometimes does not recognize the projects or eclipse finds conflicts. I really recomend it to begginers and advanced users because is a very useful tool to work with. Eclipse offers a lot of options to develop any aplication object oriented. It supports a lot of languages and you will find a lot of support on internet if yo have any problems. It's free so is a IDE to take in consideration. I use Eclipse IDE since I start to program with Java. It's easy to use and very robust. 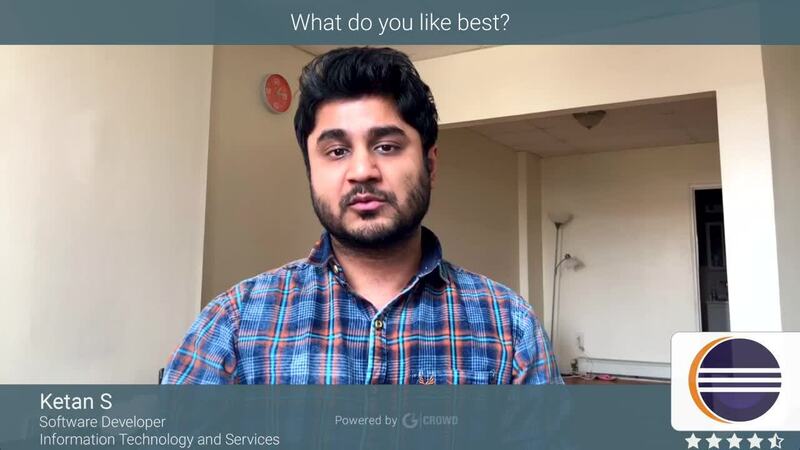 I use it for developing web applications using Spring, Hibernate, JPA, connecting it to Oracla database, and using frameworks like Primefaces. Also, it can be used for testing which I occasionally use to test with Mockito. We are presently building up an aplication for public administrations. We utilize it to test our localhost enviroments, yet additionally to test the preproduction. "Ideal IDE for Java and Spring Development"
Supports functionality for Web Services Creation. It has JSF and JPA tooling for XML editing. It has JUnit for testing purposes which can come in handy for testing your project once done to test before submitting. It allows the user to set perspectives in accordance with their needs. It also has the basic features of IDE like auto code completion, code coloring to separate the keywords and identifiers, etc. Furthermore, it provides a rich client platform, model-driven tools for EMF and so on the list goes on. There is nothing to dislike about eclipse it's one of the best IDE available in the market and has its own benefits. However, there are some occasional lags. It is a must have IDE for those who are learning Java or Java frameworks. I would also recommend this IDE to developers working in Java programming. It's open source and free to use. Plus it has surfeit amount of libraries and plugins. It's very easy to use and robust. In a nutshell its the daily driver for Java programmer. I use Eclipse IDE since I was learned Java. It's easy to use and very robust. I use it for developing web applications using Spring and Spring Boot. It has all the necessary integration support needed for Spring like Maven, JAXB, XStream, Castor, Hibernate, JPA, ORM etc. Also, it can be used for testing which I occasionally use to test my projects. "Eclipse is solid tool, but you have to know what version you need"
Works across platforms, Mac, Windows, Linux.... is fairly consistent across all of them. Lock down a version for at least a development cycle and get tools installed, then archive for all team members to use. Plan time for upgrades -- It can take some time to get new set of plugins correctly configured. Works great for developing code, I've used it for Java and C++. Also with the right plugins can be very useful for XML, XML Schemas, and HTML. 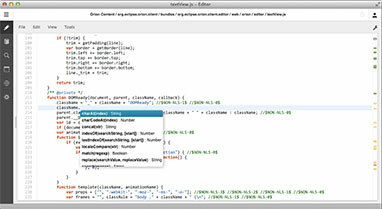 "Eclipse is a great IDE"
Eclipse is widely used with a lot of plugin and a large community that everyone can help. Predefined functions that can be used in your code, such as getters and setters. Many functions are available in the form of packages. It takes a lot time to start a new environment. Outdated GUI and not a lot of support, nor quick updates. Only good for Java. Eclipse is one of the greatest Java IDEs out there. It is slow, and not very pretty, but it gets the job done. I use it for the development of basic programs. I found it helpful to edit because it is quick to catch syntax errors and helps to organize the code more. It also has organizational advantages, making organizing files and projects easier and finding what you're looking for quickly. Eclipse es de código abierto, es muy fácil encontrar soluciones cuando tiene problemas con el software. Tiene una amplia variedad de complementos e integra el Sistema de Versión que usamos para el control de versiones del código de Java. El software también se actualiza a menudo, y los errores se reparan con relativa rapidez. La implementación en Eclipse podría ser un desafío importante cuando se trata de copiar y guardar los recursos en el directorio para garantizar que el servidor web interactúe con el problema. También se necesita limpiar manualmente los directorios, reconstruir y volver a implementar cuando usa una máquina virtual por alguna razón. Hay muchos IDE para varios lenguajes de desarrollo, Eclipse proporciona la base como una de las plataformas más versátiles disponibles. Dado que de muchas manera, Eclipse es de código abierto, hay un complemento disponible para cualquier forma de desarrollo. Pruébalo, porque un IDE general es mejor que varios entornos de desarrollo específicos. El principal problema que Eclipse me está dando ayuda es en el desarrollo de software. Se usa principalmente para desarrollar código Java. Es mejor que desarrollar código en un editor de texto simple y compilarlo en otro lugar. Además, he descubierto cómo terminar una gran cantidad de proyectos tanto de negocios como de código abierto de manera totalmente rápida. Personally it's my favourite Java IDE. This may be because it was the main one I used at University and then for the first 3 years of work. I tried switching to IntelliJ for a couple of weeks but I think it annoyed me because of the muscle memory build up from years of Eclispe shortcuts. Also, Eclipse is leaps and bounds ahead of JDeveloper in terms of stability/usability for me the best one with sublime text. Difficult to install in MacOs and many features are too old like the graphics could be more fresh like sublime text. Requires plugins for Ant and Maven, whereas Netbeans uses them as its native project format. Preferences are part of the workspace and require importing/exporting them and it has a strange work mode of linking projects with the current UI state. "Para aprender Java, el más profesional"
Lo peor es que el IDE Eclipse es muy pesado. Lleva años iniciar y, a veces, procesar documentos es muy lento o tratar de mostrar consejos. Otra cosa mala sobre este software es la piel. El diseño está muy pasado de moda. Creo que necesita algo más elegante para adaptarse a los nuevos tiempos. Una cosa más que no me gusta es el modo de depuración; es muy horrible y menos intuitivo que el modo de depuración de otros softwares. Its great.Take advantage of all the features on Eclipse. There are amazing debugging features which are very impressive coming from a free Java IDE. Tiene actualizaciones con bastante frecuencia y una gran comunidad de usuarios detrás, por lo que tendrás un gran software en continúa actualización y mejora. Fue una de nuestras primeras opciones para el software que desarrollábamos de cara a aplicaciones para control y uso de nuestro vehículos eléctricos, el motivo es el precio, gratuito, y también la facilidad de uso para usuarios medios como éramos nosotros. Anteriormente, usábamos otros programas que no terminaban de ofrecer todo lo que necesitábamos, ya que eran inestables, un compilador menos eficiente o que eran muy caros. Con Eclipse tuvimos todo lo que necesitábamos. Tiene muchas funcionalidades y cumple su función. Además, ha sido ampliamente utilizado, por lo tanto, hay un gran apoyo, especialmente en stackoverflow, que es básicamente el lugar de referencia para todo tipo de problemas tecnológicos. Es lento en la actualización y construcción del proyecto. Tarda mucho tiempo iniciar el espacio de trabajo y también cambiar el espacio de trabajo. si necesitas modificar alguna configuración, es difícil de encontrar e implementar. Se necesita mucha memoria para ejecutarse y, a veces, ralentiza la máquina y necesita reiniciarse. Lleva tiempo instalar un complemento diferente en Eclipse. Si necesita trabajar en diferentes aplicaciones (Android, Java) use Eclipse. Es gratis y hace el trabajo de manera eficiente. Explore los plug-ins disponibles. Hay muchos de ellos, muy útiles y es una de las características más potentes que ofrece este producto. Aprender cómo aprovecharlo al máximo le dará la posibilidad de trabajar en muchos proyectos diferentes con todas las integraciones de herramientas que pueda imaginar. Utilicé Eclipse para los proyectos académicos y en la empresa para la que trabao. Me benefició en términos de proporcionar una gran biblioteca para las API de Servlets de JAVA y JAVA EE. Es muy rápido en caso de programación. Como proporciona formatos / estructuras para clases, paquetes, etc. me ahorró tiempo y pude completar mi tarea a tiempo. "Excellence to create your projects and develop at a high level"
In many aspects eclipse helps in the software development process, has high level tools that allow you to carry out high level projects, has a great development team providing new plugins of great level and with a great variety of utilities that contribute much help at the time of development, you can find great documentation on the network that will help you both to improve the use of the tool and to know how to find and install the plugins that you need for your development, this also with help as ide at the time of scheduling , a debug of great level that helps you to find errors in your code and be able to solve much faster. For this and more reasons you should try eclipse a high level IDE but also very intuitive perfect for people who are starting to program as well as experts in the field. One of the clearest disadvantages of eclipse is its use to program in java, since it lacks a lot of support for webapps (.war, jsp and servlets), this can be found in other IDEs, and the plugins that try to repair this do not they are so complete or they still have faults in this regard, you must take this into account and depending on what you use you must take care of this. It is an excellent option for a company because it has a perfect balance for new programmers and experts, highly configurable by means of plugins that will allow you to confiure the tool to your tastes and according to what you need for each project. Have a development environment that is very intuitive and is perfect for both new programmers and the most expert, which is highly confiurable, with a large number of plugins and high efficiency. "An excellent development tool for multiple purposes "
Excellent for creating MAVEN projects with different libraries quickly and safely. I like to work with Eclipse when I have to develop very large and robust projects. Easy to use, easy integration with GIT, easy to Install and configure. Eclipse is a free, with powerful Java integrated. Useful for mobile applications, desktop, web, perform services, a program with a lot of potential. some configurations are very cumbersome, and It is a bit limited to develop applications with high graphic content. Needs improvement in performance as it take some time to load and sync the code. Eclipse allows to solve problems of multiple environments, its great capacity and compatibility with Windows, Mac, and Linux devices, it helps the development of many fields, such as web development, mobile development, soa architecture, and creation of applications that satisfy customers with different needs. "A solid IDE to work with"
Eclipse is a good option when you want an easy to use IDE. It has a decent interface and a great variety of supported plugins and packages. Also, I like the idea of drag and drop feature for the plugins. In genera, solid free option for an IDE. Compared to its competitors, it's poor on design. It gets quite heavy when it comes to start a new project (lots of stuff are loaded) and when a restart is needed after installing new packages. I am using Eclipse for test automation purposes. I like how it incorporates all the necessary plugins and packages to create a test automation framework.